One of the pioneers of this approach was the late psychiatrist, Milton Erickson. 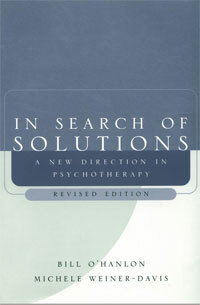 One of his cases is a nice illustration of using solution-oriented therapy. Erickson once worked with a woman called "Ma" (Rossi, 1980, Vol. 1, pp. 197-201), who had always wanted to learn to read and write but had never been able to overcome her block to these goals. She was not given the chance to acquire these skills when young, and at age 16 she resolved that she would learn. At the age of 20, she hit upon the idea of taking in teachers as boarders and having them teach her to read and write. In the years that followed, her boarders and then her children relentlessly tried to teach her, all to no avail. She would become frightened and go blank whenever anyone tried to explain reading and writing to her. At the age of 70, still unable to read, she came in contact with Erickson. He promised her that she would be reading and writing within three weeks and that he would ask her to do nothing that she did not already know how to do. She was skeptical but intrigued. First, he asked her to pick up a pencil. He told her to pick it up in any haphazard fashion, as a baby would. Next he asked her to make some marks on a paper, any scribbling marks, as a baby unable to write might do. Then he asked her to make some straight lines, as she would do on a board that she wanted to saw or as she would in a garden when she wanted to plant a straight row. She could make the lines up and down or across or diagonally. Then she was to draw some donut holes and then draw the two halves of a donut when it is broken in half. Then she was to draw the two sides of a gabled roof. He continued to instruct her to make these marks and to practice them. She practiced although she did not see its relevance. At the next session Erickson told her that the only difference between a pile of lumber and a house was that the latter was merely put together. She agreed to this, but again did not see the relevance. With Erickson's guidance, she put those marks together to make all the letters of the alphabet. When she had completed that, Erickson let her in on the fact that she had just learned to write all the letters. Spelling words was merely a matter of putting letters together, he told her. After getting her to put the letters together, he told her that she now knew how to form words. Erickson got her to name certain words because each word has a name, just like each farm animal has a name. Gradually he maneuvered her into writing a sentence and had her name all the words in it. The sentence read, "Get going Ma and put some grub on the table." When she said this aloud, she realized it was just like talking (her late husband had often used this phrase). The translation into reading was easily made within a three-week period Bill Remembers the first case in which he (somewhat by accident) used the solution orientation presented in this book. He had just started working in a mental health center when a former client of another therapist sought help on an emergency basis. The woman's therapist was on vacation and Bill had time available, so he agreed to see the woman. Not wanting to interfere with what the other therapist would be doing when she returned, Bill was cautious. He asked the woman what had brought her this particular day and whether this was related to what she had seen the other therapist about previously. The woman reported that she had seen the other therapist about being depressed for about a year and that they had stopped doing therapy some time ago because she had overcome the depression. Bill then asked how she had learned to overcome the depression. The woman proceeded to give a detailed description of several strategies she and the other therapist had come up with to enable her to avoid sinking into depression when she started to feel down. These included calling a friend on the telephone, going for rides on her bicycle and making sure that she continued her regular activities, like going to college and work. She brightened considerably while discussing these ideas. Bill asked her if she thought those things would work for her now. She replied that she thought they would, but that she had forgotten them until he asked. She ended up telling Bill that she now knew that she did not have to be in therapy to solve her problem, but she also recognized that if she had not come in, she would have gone into a deep depression. The interview had lasted 20 minutes. Bill had done brief therapy for some time, but 20 minutes was even more brief than he had thought therapy could be! When the other therapist returned from her vacation several weeks later, she made a follow-up call to her ex-client and found that she was getting along fine, with no recurrence of the depression. A case of Michele's shows yet another facet of this solution orientation. This little girl had the family turned upside down. Janet felt certain that her lack of parenting skills caused Mindy's intolerable behavior. Not only did Janet feel inadequate, but she also felt extremely guilty for not experiencing feelings of love toward Mindy much of the time, something she felt that all good mothers do. To make matters worse, Mindy behaved appropriately in the presence of others and received a great deal of attention from them, further convincing Janet that she was the cause of the problem. This, in turn, intensified Janet's feelings of inadequacy and alienation. Ken, the father, was also concerned about their "monster," particularly because he felt bombarded with negative reports about her as soon as he entered the door at the day's end. He also came home for lunch every day, an act of either bravery or masochism since he was barraged with the details of the Mindy-Janet war while he ate. He felt that the marriage was suffering due to the fact that their only topic of conversation was Mindy. He missed the fun times he and Janet used to have together. During the first session it was quite a feat to help the couple interrupt their litany of complaints and focus on a starting place. However, Janet made an offhand comment that suggested a possible beginning. She reported that she was able to tell what kind of day she would have with Mindy just by the way the child got up in the morning, Michele was eager to explore this further. Janet explained that every morning she would be awakened by Mindy's voice calling, "Mommy, I'm up." To Janet's ear, sometimes Mindy sounded cheerful when she bellowed out her good morning greeting, while at other times she sounded whiny. Depending on how Janet assessed Mindy's voice, it would determine the type of greeting Mindy received in return. If Mindy sounded cheerful to her, Janet knew they would have a good day. At those times, she would walk into Mindy's room and begin the little routine ditty they had created together: "How is Mommy's little girl?" "I'm fine." "Who loves Mindy?" "Mommy does." Janet and Mindy would then spend a few moments together before going downstairs for breakfast. Typically, the rest of the day was relatively peaceful. If Mindy sounded whiny to Janet, she would go to Mindy's room with apprehension and anger, and she would not initiate their little song. Of course, Mindy would then confirm Janet's predictions and begin whining, which marked the beginning of a battle-filled day. Michele asked Janet if she would do an experiment. She suggested that whether Mindy woke up cheerful or grouchy, Janet was to walk into Mindy's room pretending that Mindy was cheerful. This meant that Janet was to have a smile on her face and immediately break into their song regardless of Mindy's mood. Janet immediately thought that this was an interesting idea and was willing to try it. The next week the couple reported a better week with Mindy. She seemed to have settled down and was more enjoyable to be around. Janet and Ken discussed the positive effects this had on their relationship - more relaxed times and even some laughter. What shocked them the most was that, although Mindy's behavior was far from perfect, she had mysteriously toilet trained herself completely that week! Several sessions later, while we were reviewing their progress before ending treatment, Janet reported that the morning experiment was a real turning point for her. She recognized that she could keep things moving in the right direction despite Mindy's challenges. Furthermore, Janet and Ken had successfully applied this idea to other difficult situations with Mindy. In the 1960s Abraham Maslow decided that psychology had been moving in the wrong direction. Almost from the start, most psychological inquiries had explored and tried to understand the nature of emotional, behavioral, and psychological pathology in human beings. Maslow said that instead we should be studying the best, healthiest specimens of human beings to learn what we want to know about people. In a similar vein, psychotherapy has for most of its history focused on studying and trying to eliminate people's problems and pathology. There is, however, an emerging trend - a shift in focus from pathology and deficits to strengths, capabilities, and resources in therapy. There is also a move away from searching for the explanation for the person's difficulties, for the real problem, to looking for solutions that will work for the particular individual, couple, or family seeking therapy. Therapists often disagree about what causes problems, but there is more agreement about solutions. This has given rise to what is called "technical eclecticism" in the field of psychotherapy. For example, many therapists use such techniques as systematic desensitization from behavior therapy, but have little allegiance to the behavioral model; in fact, they might find behaviorism quite objectionable. Not wishing to argue with success, therapists seem willing to borrow from outside their primary models for successful interventions from other models. Perhaps we are too optimistic in calling this emerging trend a megatrend. In reality, we might simply say that there is evidence for this shift in many places. However, we write about the megatrend in an effort to contribute to its creation. In response to the widely discussed question, "Does the media simply report the news or create it?" we maintain that it does both. Therefore, we are excited about the prospects of being instrumental in transforming this trend into a megatrend. We like the Zen saying, "In the beginner's mind there are many possibilities; in the expert's mind there are few" (Suzuki, 1970). Adopting this attitude in our work, we find it to be conducive to continually learning new things. Our clients perpetually teach us how to work with them and how to help solve their dilemmas. We have yet to find a formula that captures the diversity of human beings. This book is no different. While we offer our views on how to make therapy work, we are aware that we do not have The Answer to every therapeutic dilemma. From our experience we are confident, however, that the approach we offer here is successful for the majority of people who seek our help in therapy. We ask that you, the reader, approach this material with a beginner's mind. Some of the things we write might challenge some of your long-held and cherished assumptions about therapy. We have spent many years unlearning some "basic" assumptions about problems and psychotherapy. We often think of the research showing that people about to enter graduate studies in psychology tend to be "naturally therapeutic." When tested at the end of their graduate studies, however, they seem to have fewer of these skills. Five years after completing their studies, their natural skills return. When we teach this material in workshops, we are often approached by clinicians who tell us that they have been doing many of the things we discuss intuitively, but feel better having them validated by some theory and expert. With this book we hope to stimulate your "beginner's mind" and your natural therapeutic abilities. Finally, it would be a good idea to keep in mind a story that we heard, one which always reminds us that nobody has the definitive answer or final solution to all of human dilemmas. There was once a man who gave a class for parents on how to parent. He called it, "Ten Commandments for Parents," and parents, being insecure about their abilities, came from far and near to attend his class and learn how to be better parents. At this time he was not married and had no children. One day he met the woman of his dreams and got married. In time they had a child. He then retitled his class, "Five Suggestions for Parents." In time they were blessed with another offspring. He then renamed the class, "Three Tentative Hints for Parents." After their third child was born, he stopped teaching the class altogether.